Depression always ends. Not because of Prozac. Not because of Psychotherapy. Not because pf psychoanalysis or shock treatment. Depression always ends because it is its very nature of depression to end. Now the question is, how can we get it to end sooner, the way we want it to, instead of later, which we hate? Depression can be the fight of your life. You can win that fight. This is the last book about depression you will ever need. 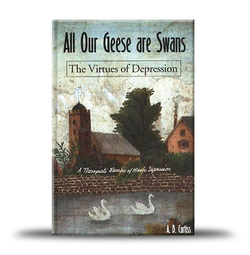 This breakthrough book has redefined the whole concept of depression, as we know it. A cognitive behavioral therapist who cured her own 30-years worth of manic depression, show how to make the impossible possible. There are new concepts, thought processes, and small mind-tricks that can get us out of the worst of it without dulling our mind and personality with drugs. Here are the causes, the cures and a path to follow that is solid and real. It draws from the latest discoveries in neuroscience, ancient wisdom and simple hypnosis as well as cognitive behavioral therapy. This is not an ordinary book. This is the answer to depression-what it is and how you can fix it. Ten years ago, as a result of my work as a cognitive behavioral therapist, my struggles with my own severe mood swings, and my experiences with those who came into my office looking for help with their problems, I discovered the real cause of depression. I have not "been depressed" since that time. This book is not ordinary in another respect. The trouble with many theories is that they may depend upon some faulty but hidden premise that we do not think to ferret out because we are so caught up in the admiration of our excellent logic. We are all subject o this touch on intellectual arrogance. So I do not depend upon my logic as proof that my theory works. I am sure of my theory because I have already cured myself of depression, after suffering it for 30 years, after watching my brother succumb to the same ravages of manic depression that killed my father, and I have remained cured for more than ten years. So my logic does not proceed from a disease in search of a possible cure. My theory starts with the cure itself and goes backwards to see how I did it. Over the years I have been urged to put some of my insights and techniques down own paper, to "tell the real truth" about depression-that there are certain habits of mind which cause all the trouble, and we can change those habits and discover the perfectly all right person trapped inside the frozen agony. We are all like Michelangelo's statue of "David," of whom the artist said, "David was already there, perfectly formed in the marble. All I had to do was to chip away everything that was not David." The answer to depression is to chip away everything that is "not us."